Capercaillie Cottage in Rhilochan, Rogart, near Dornoch, Highlands sleeps 5 people. Capercaillie Cottage near Dornoch is a detached and quintessential romantic hideaway which lies deep in the Sutherland hills on the owner’s croft with sheep and beef cattle. Over 200 years old and accessed by a track, it has 2ft thick stone walls and traditional tin roof, and has undergone a unique and innovative conversion, together with an adjoining stone barn. Transformed into a holiday home offering a bright and contemporary living space, it retains the very best of its original charm. A large wood burner and uninterrupted views across miles of open hillside, as well as a hot tub on the elevated decking outside, add to the experience. The stunning main living area is open plan, with a large wood burner at one end and a well-equipped, contemporary kitchen with handmade units at the other. Steep ladder stairs lead up from the kitchen to a bedroom, which occupies the whole of the mezzanine area. Very low double doors open through to the ground floor en-suite bedroom, but due to the height and depth of the stone wall, it is advisable to access this bedroom from the part-covered walkway around the perimeter of the cottage. This charming bedroom has a hairdryer provided and a feature claw-foot bath, as well as an adjoining en-suite. At the opposite end of the cottage is a bright shower room, accessed via the part-covered decking. 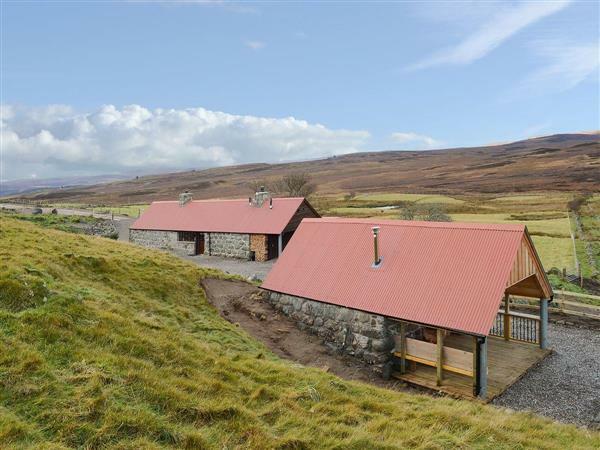 Another bedroom (also with hairdryer provided) is located within a separate stone barn conversion a few steps from the main cottage, and enjoys the same incredible views down the glen to the hills beyond. Capercaillie Cottage is superbly well equipped and furnished, with deep leather sofas and high quality appliances throughout. It is set within 1 acre of grounds, with raised decking and hot tub located just outside the main entrance, with a feature ornamental pond below. The owners work 300 acres of the surrounding croftland and hills, which you are welcome to explore with their prior permission. Wildlife is prolific in the area, with red deer, pine martens and abundant birdlife, including rare red kites, golden eagles, oystercatchers and curlews. Whilst the location is completely secluded, the charming village of Rogart is 4 miles away, with its thriving village pub and restaurant, shop, post office and railway station. Visit historic and archeological sites, as well as romantic castles such as Dunrobin, seat of the Dukes of Sutherland. Mountain biking along lovely forest trails, golf, fishing and various water-sports are all available. The picturesque seaside town of Dornoch, with its award-winning sandy beach and championship golf course, is just 20 minutes’ drive away. 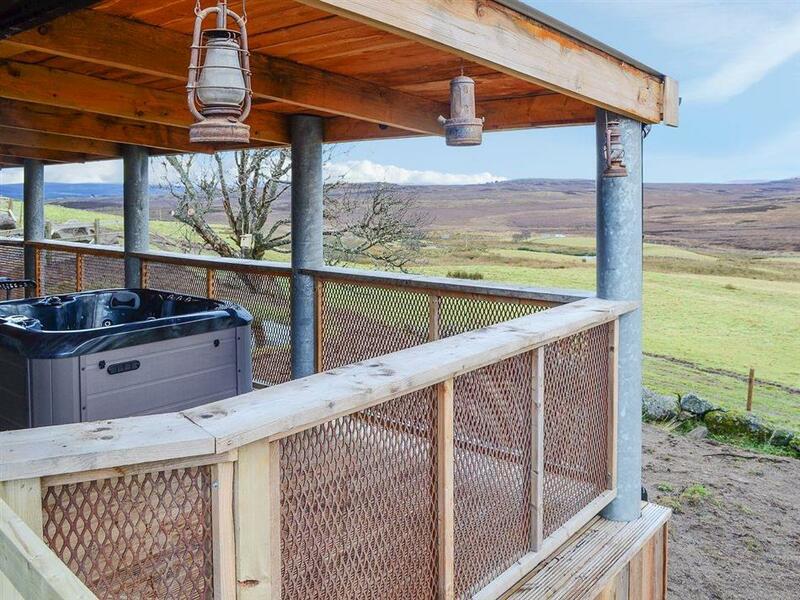 For the less energetic, sit back, relax, enjoy the hot tub and watch the ever-changing scenery from this inspiring and totally unspoilt location. The beach is 12 miles from Capercaillie Cottage near Dornoch. With the shop, pub and restaurant 4 miles from Capercaillie Cottage. Living area: With wood burner, 29 Freeview TV and DVD player. Kitchen area: With gas cooker, fridge, freezer and dishwasher. Bedroom 1 (very low doorway, alternative covered external access): With double bed, Freeview TV, claw-foot bath and en-suite toilet. Shower room (covered external access): With shower cubicle, toilet and heated towel rail. Bedroom 2: Galleried with ¾ double bed. Bedroom 3: With LPG wood burner, double bed and Freeview TV. LPG underfloor central heating, gas, electricity, bed linen, towels, Wi-Fi and logs for wood burner included. Welcome pack. Enclosed 1-acre garden with decking and garden furniture. Hot tub for 4 (private). 300-acre croftland (shared with owner). 3 dogs welcome, to be kept on a lead (working croft). Private parking for 4 cars. No smoking. Please note: There are 2 steps to the decking and hot tub, and there is a fenced pond in the grounds adjacent to the garden. Holidays at Capercaillie Cottage run from Saturday to Saturday. Pets allowed at Capercaillie Cottage. For a better idea of where Capercaillie Cottage is, you can see Capercaillie Cottage on the map below. Capercaillie Cottage is in Sutherland; should you be on the lookout for a special offer, you can find all the special offers in Sutherland. It's always worth checking to see what is on offer at the moment. Do you want to holiday near Capercaillie Cottage (UK5645), you can see other cottages within 25 miles of Capercaillie Cottage; have a look to find your perfect holiday location.